The Old Paris French Porcelain Ring Box and Dish are some of my very favorite items. I paid $10.00 for the box at an estate sale. The Goat was a little more precious, but I had to have it. This little bisque nodder is so special. I just can not help but love it. Every time I pass it I have to pluck it with my finger and watch the chicken dance. This little Child's Cranberry Epergne is a rare and dear item. I have lots and lots of Victorian Domes but this one is my favorite. It is full of hand made crepe paper roses. I man brought this into my shop and wanted to sell it. I bought it and have loved,loved,loved it, ever since. This was the first needlepoint pillow that I ever bought. It was at a consignment shop and cost $10.00 It is all stump work, and the cabbage roses are all 3-D. I can not pass this pillow with out hugging it. I love it all, even the old faded satin backing and ruffle. I found this old wonderful piece of needlepoint at a shop. It was in bad shape, but I do not care. Nothing makes me smile more than this sweet dog. At one time he had a letter in his mouth that said,"please post", it was worn away, but I love it any way. I made it in to a pillow many years ago. We all love the things we collect and decorate our homes with. Some people have antiques, while other have vintage or new. Many of us have family things, that we may or may not love,love,love!. But, we do cherish them and want them as part of our lives. I have very few family things and that makes me sad. When I go to estate sales and see people selling there family items, I can not understand it, and wonder why they would want to? Most of the antiques that I have bought for, My Old Historic House, are things that I love. collect and admire. Some are very expensive, while others ,cost hardy anything. I am sure, just like me, you all have favorite things around your house. To me,what make them a favorite, does not mean it has to cost a lot or be so rare. Some of my favorite items cost only a few dollars and are tiny and really kinda dumb.Most of my favorite things have stories attached, as to, where I found them, when I found them, some one gave it to me, or it just makes me smile. I have been in the antique business for about 4o years and I have had and sold many a thing. It is always fun to think back at some of the items I have owned and sold. Most of the time I have no problem with these items, but some times, I had a very special thing and after I sold it, I always long for it back, having regrets, that I ever sold it, in the first place.You might ask, why did you sell it then., There are many reasons, but, more often than not, I probably needed the money. Being self employed is not always all it is cracked up to be. Especially when there are bills to pay and no pay check. When I antique shop with many of my antique dealer friends, we often find ourselves saying, I had that and I was always was so sad after I sold it. I have a pair of these. They are Italian and very old. They are made out of tin and hand painted. The urn shaped base is wood and gold leaf. They were used for Funerals in the old days. Fresh flowers were hard to get, so they used these instead. I have had several pairs of these. I usually found them cheap, as the seller did not realize what they had. I was always offered big prices for them, so I sold them. I bought this pair at a high end antique show in St.Louis. I have never wanted to sell them, it is a good thing as I am sure I over paid. Small price for love. I bought a pair of these Victorian French curtain tie backs on Ebay. I got them for a good deal. I cherish them and have looked and looked for others. I found a set of 4 in New York. My Mother always said go first class or stay home. well. I had to stay home, as the ones in New York were way over my budget. I bought this little English bronze and opaline salt cellar at a flea market in the country. They had a $25.00 price tag and I asked for a btter price. Just could not help myself. I got it for $20.00. I held it all the way home. I just adore the little dog with a beggers hat in his mouth. I have a pair of these vases. They are French Limoge and are some of the biggest pieces of Limoge I have ever seen. I bought these when I was 15 and 16 years old. I put them in lay away and it took me over a year to pay for them. The gentleman that owned the shop where I got them was wonderful and very patient. I worked doing farm chores to pay for them. I paid $200.00. I have never wanted to sell them. I tell some people I was born with one of these vases in each hand. My dear friend, Blossom, gave me this sweet little thing for my birthday many years ago. We were on a antique buying trip and I admired it and she got it for me. It has been a favorite every since. That was about 20 years ago. Thank you, Blossom. In today's Post, I have picked a few of my favorite things. Just like the song, from the Sound of Music, there is a mixtures of things, big and small, fancy and plain. I hope you enjoy my favorite things and come by for a visit. I love to get your comments and that is the main reason I blog. So take the time to write me a note and mention you're favorite things. Please come by any time for a real tour of, My Old Historic House. I will always leave the lights on for you and I would be more than thrilled to share my favorite things with you. And, oh yes, Sissy Dog will always meet you with a jump and a kiss. ENJOY!. I have 2 Southern Magnolia trees out in my side yard. I got them the second summer I had the house. 2007. They were 6 foot tall, now they are 12. I have babied and worry over these trees more than if they were my child. I have always wanted a magnolia tree, and now I have 2 and I just adore and love them. And finally, last but not least. 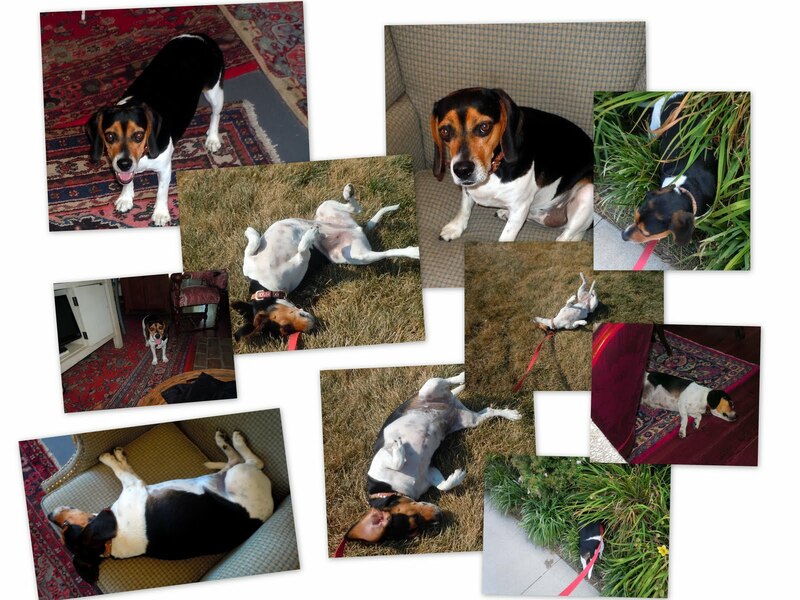 My most favorite thing in the whole wide world is, Sissy Dog the Spoiled Beagle. Words and emotions can not begin to say how much I love and enjoy her. She is my best friend and constant companion. She is the bestest, best ever, girl in whole wide world. I just wanted to give a shout out to Dawn The Bohemian over at Bohemian Valhalla. I sent her a copy of Victorian Homes magazine. The June 2011 issue, which did a feature about, My Old Historic House. She was having trouble finding it where she lived, so I sent her one.As a thanks you, I got this wonderful package in the US Mail today. Dawn you are far to generous.You shouldn't have done all this. I love it. There was a beautiful Roseary, dog treats for Sissy, and a wonderful Victorian Glass Easter egg for my collection. OMG. I love it and was so surprised. Thanks you so much. Hey, everybody, go and visit Dawn's blog, I am sure you will love it.